NASHVILLE, Tenn. - The Nashville Sounds coaching staff for the 2015 season was named today by the Oakland Athletics and it features a veteran manager with a pair of personnel additions from Double-A. 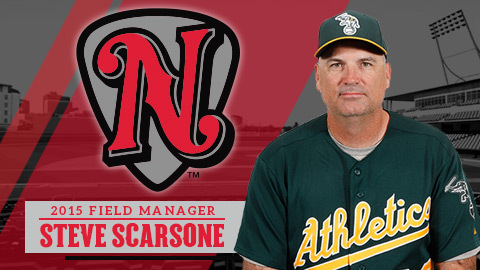 Steve Scarsone will join the Sounds as manager and becomes the 26th manager in the team's 38-year franchise history. It will be his seventh season in the Oakland organization. His coaching staff will consist of pitching coach Don Schulze, hitting coach Webster Garrison, trainer Brad LaRosa and strength coach Terence Brannic. The 48-year old Scarsone started coaching with the Arizona organization in 2001 and spent two years as a manager in the minors. He then stepped away from baseball for several years, before entering 2009 as the manager for Oakland's Single-A team. He worked his way through Advanced-A Stockton (2010) and Double-A Midland (2011-12) in the years ahead, before being named manager for Triple-A Sacramento in 2013. This year will mark the third consecutive season he will manage Oakland's top minor league affiliate. Scarsone compiled a .549 winning percentage over the last two years at Triple-A, posting a 79-65 record in both campaigns. He holds an all-time mark of 568-554 (.506) and has posted winning records in five of his eight seasons as a manager. The Anaheim, Calif. native featured a 14-year playing career and made his Major League debut on May 15, 1992 with the Philadelphia Phillies. He appeared in the PCL during his playing days for parts of three seasons, including Triple-A Vancouver in 1998. Schulze was named the Sounds' pitching coach for 2015 after having served in the same capacity at Double-A Midland the last four years. He broke into the A's organization back in 2006 and has coached at virtually every level of the minors. Schulze spent a pair of seasons with Kane County (2007-08) and Stockton (2009-10) before landing with Midland in 2011. The pitching numbers improved every year under his watch at Double-A. After recording the second-worst earned run average (4.92) in the Texas League during 2011, the RockHounds progressed each season and finished 2014 with a 3.71 ERA, tied for second-best. The 52-year old was selected by the Chicago Cubs in the first round (11th pick) of the 1980 amateur draft. After making his Major League debut with the Cubbies on September 13, 1983, Schulze went on to appear with five different MLB teams over the span of an 11-year playing career. Garrison was named Nashville's hitting coach for the upcoming campaign. He enters his 15th year with Oakland as either a manger or a coach, the longest tenure of any on the staff. Garrison had spent 10 seasons at Midland serving as a player-coach, manager and hitting coach. He was a part of championship years in 2005, 2009 and 2014 and possessed a 147-133 record during the two seasons he managed the ballclub (2004, 2008). Overall, the Louisiana native has accrued a 534-522 managerial record throughout four different minor league levels. The 49-year old was selected in the second round of the 1983 amateur draft by Toronto. He compiled a 16-year playing career and made his Major League debut with Oakland on August 2, 1996. LaRosa will return to Oakland's top minor league affiliate for his eighth season as athletic trainer. Prior to joining the Athletics, he spent five seasons at Double-A with St. Louis (2005-07) and Miami (2003-04). LaRosa has been recognized with several different accolades and awards, including the PBATS Minor League Trainer of the Year in 2007. He is a certified member of the National Athletics Trainer Association and the Illinois Athletics Trainer Association. LaRosa obtained both his bachelor's and master's degrees in kinesiology from Southern Illinois University at Edwardsville. Brannic will enter his first season as the strength and conditioning coach at the Triple-A level. He began in the Athletics' organization in 2013 and spent the past two years at Midland. Brannic will be responsible for all the day-to-day conditioning responsibilities of the club. The Sounds' 2015 home opener will be played on Friday, April 17. Season tickets packages for First Tennessee Park are currently on sale. Call 615-690-HITS to order or for further details.